Ah, the vagaries of the British weather. Last week: wind and torrential rain, this week: clear skies and temperatures in the twenties centigrade. I’ve veered from wearing boots and a winter coat to shorts and flip-flops in the space of four days. I’ve attended some very chilly Chelsea Flower Shows in the past, but tomorrow looks set to be fine and dry. Out with the short-sleeved shirt and dare I risk bare ankles? That would be a Chelsea first. 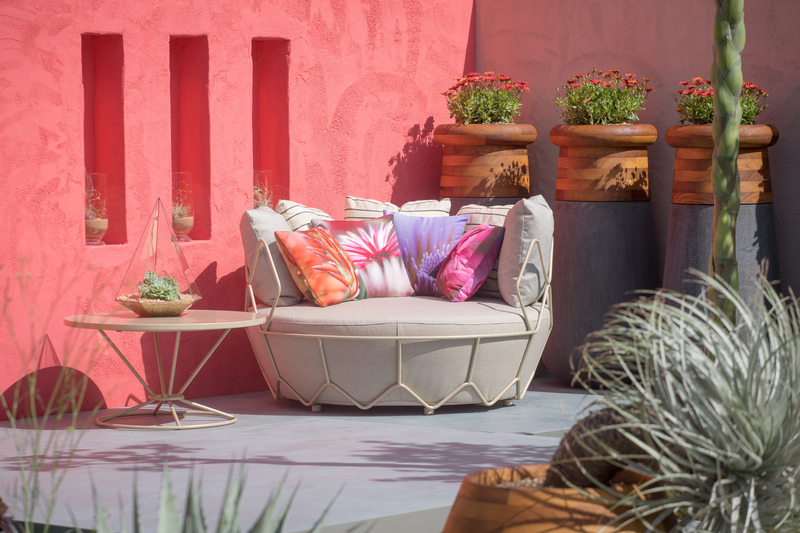 Even if the sun does remain behind the clouds, one garden is guaranteed to provide us all with a lift: Beneath a Mexican Sky designed by Manoj Malde for sponsors Inland Homes. 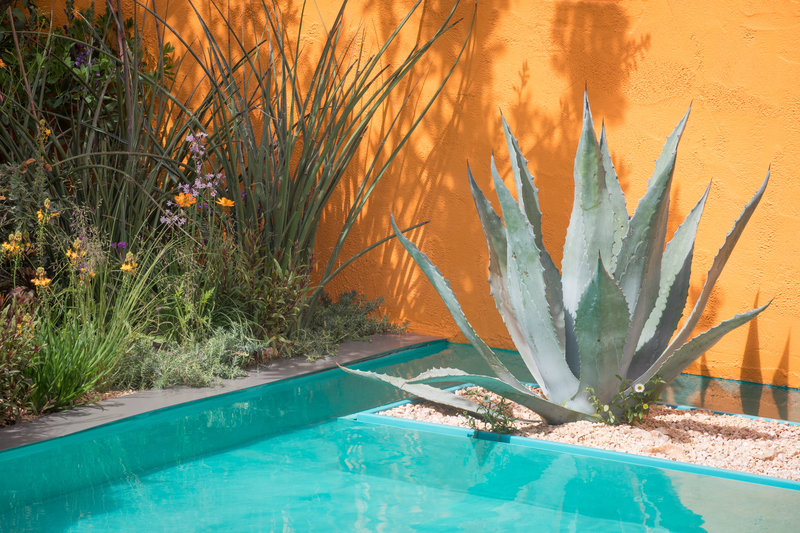 This bold, exuberant garden, with its walls washed with tints of clementine, coral and cappuccino, is inspired by the work of Mexican Modernist architect Luis Barragán. Manoj Malde has brilliantly captured the essence of Barragáns brutal-yet-bright style in a garden that begs to bask beneath a beating sun. It might, perhaps, be a garden to dream of rather than one to recreate at home: the planting demands super-dry conditions and the colours require strong light to make them sing. However, the design’s simple layout and generous seating area will appeal to anyone who yearns for contemporary design and architectural planting. In contrast to the bright walls, the concrete deck balancing elegantly over an inviting pool is cool and smooth. I am not a fan of a grey, but here the colour works perfectly with the silvery foliage of Agave parryi var. truncata, Agave amerciana and beautiful, felty-leaved Kalanchoe behariensis. 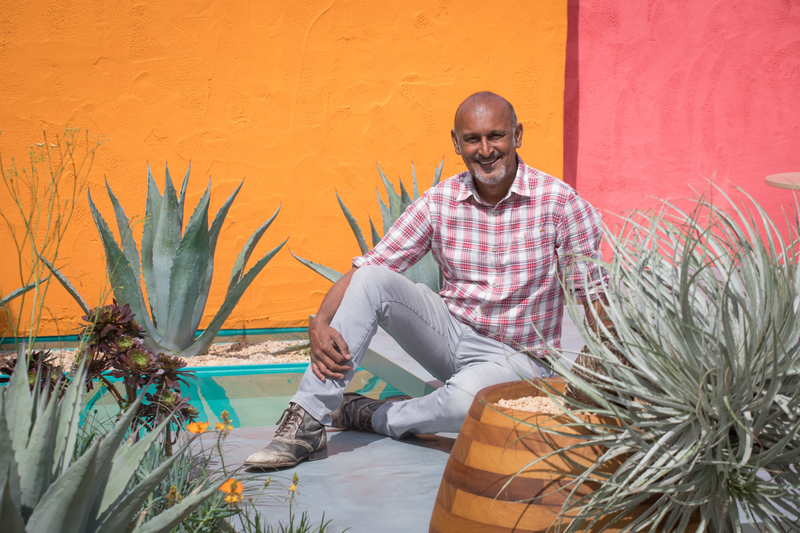 Manoj believes it is the first time that a designer has used this unusual Madagascan plant, also knowns as velvet elephant’s ears, in a Chelsea garden. The variety ‘Fang’ has an Award of Garden Merit from the RHS and irregular toothed protrusions on the underside of every leaf. Another first for the show is a specimen of Agave parrasana which has produced a 4m high flower spike bang on cue for opening day. 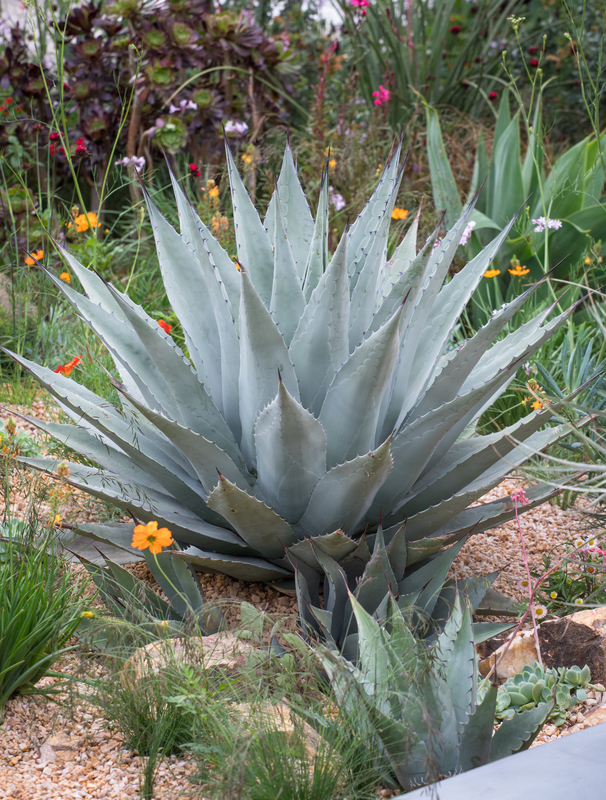 The agave’s candelabra-like inflorescence, which has emerged from a compact rosette of succulent, grey leaves, won’t be casting much shade. That job is left to a fine, multi-stemmed strawberry tree (Arbutus unedo) which produces flowers beloved by bees and fruits that can be used to make jams and liqueurs. Luis Barragán liked to create contrast using shadows. In this design another succulent, this time a cactus, Stenocerus marginatus, is underplanted with the popular Mexican fleabane (Erigeron karvinskianus). 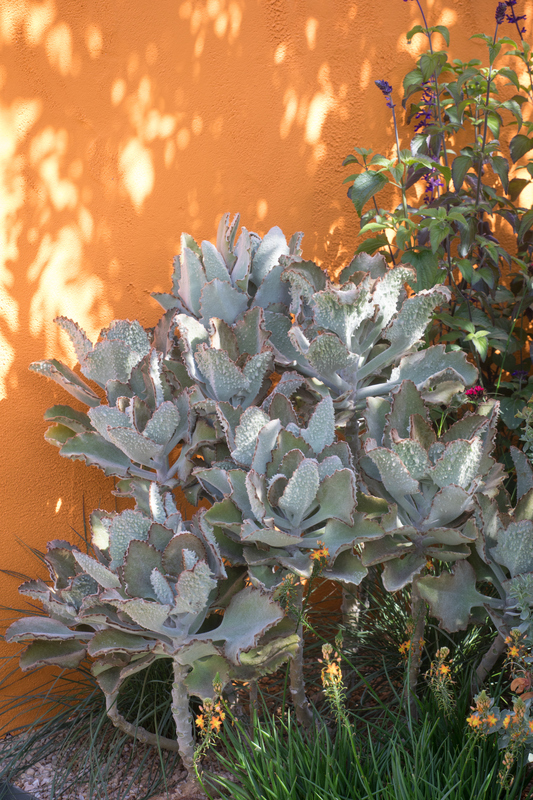 Set against a wall painted in a delicious shade of taupe, the cactus looks cooler than a cucumber. 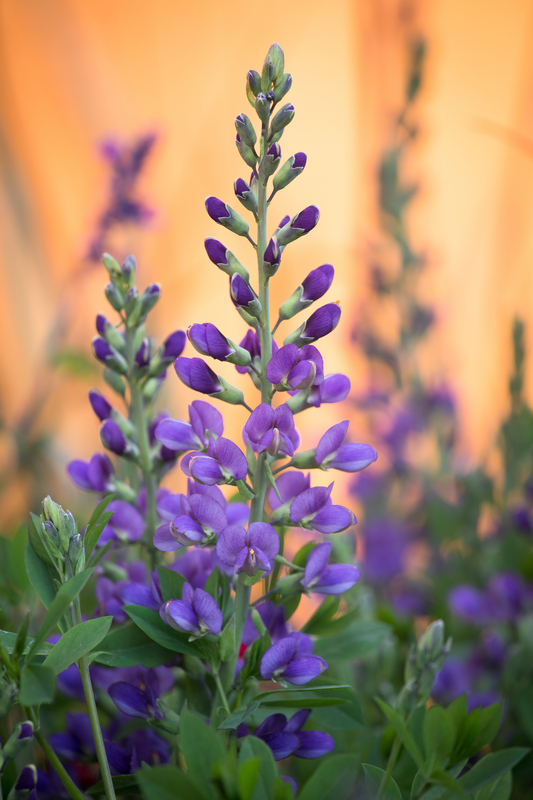 For flowers lovers there are plenty of blooms in scorching colours, including purple bearded irises ‘Modern Woman’ and ‘Serene Moment’, Cleome hassleriana ‘Violet Queen’, Baptisia ‘Blueberry sundae’, orange Cosmos sulphureus and almost black Cosmos astrosanguineus. Manoj Malde was born in Kenya and trained as a fashion designer, working in the industry for nearly twenty years, before retraining in garden design. 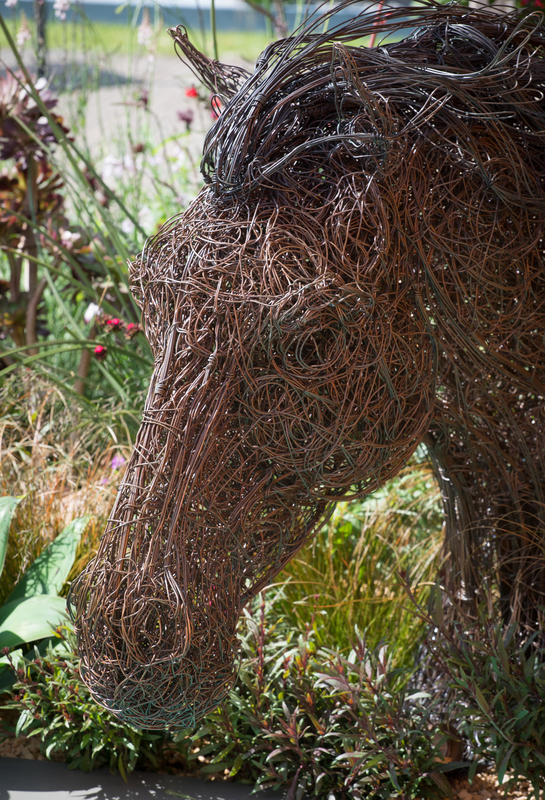 His innate sense of style is evident in every detail, from the planting, to the colourful cushions arranged on the love seat and finally Rupert Till’s equine sculpture, which references Barragán’s love of horses. At night, Beneath a Mexican Sky is cleverly lit so that the plants create interesting shadows as darkness falls. The two strawberry trees are under-lit, projecting shadows from the multi stemmed trunks onto the coral and clementine walls. 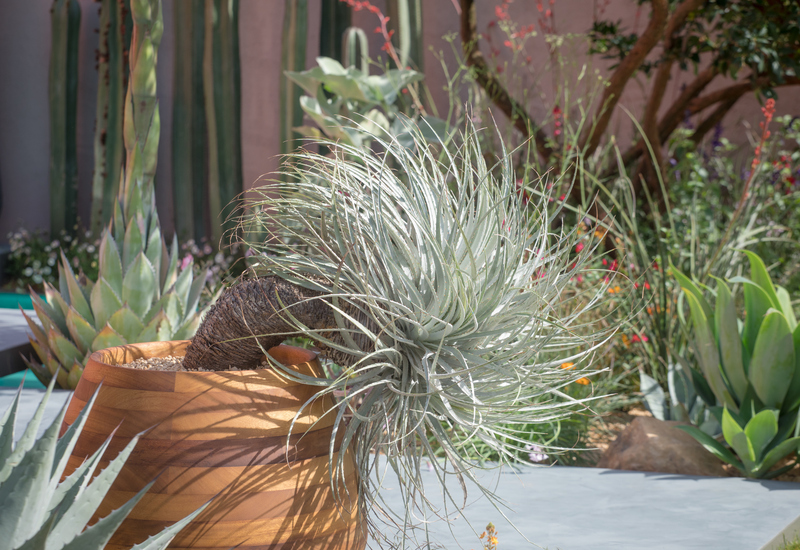 Agave parrasana and the organ cactus, Stenocerous marginatus, are lit from the side so that their striking architectural forms make dramatic shapes. The illuminations lend the garden a cosy pink glow, supplemented by six glass storm lanterns housed in rectangular niches. The water in the pool is lit from under the grey cement steps, concealing the light source and making the bright turquoise cement that lines the pool shine invitingly. So what can we take from this garden? The structure and layout could certainly be replicated in a traditional, rectangular suburban plot blessed with a sunny aspect. The pool might be traded for lawn or a section of paving in a contrasting colour if water was not practical. To achieve anything resembling the planting one would need exceptional drainage or raised beds and some cover for the agaves in winter. This could be managed by supporting sheets of plastic over the rosettes or by lifting the plants and bringing them into a brightly lit conservatory. 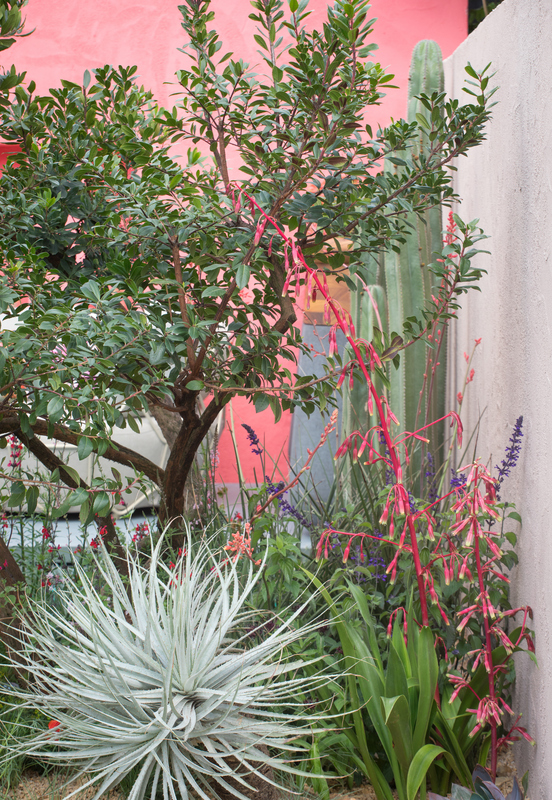 The colour combinations are gorgeous, demonstrating the versatility of silver-grey foliage plants. I particularly like coral, fuchsia, violet and silver-grey association, but also the mixture of clementine, turquoise and lilac. If all that sounds a bit much, then this probably isn’t the garden for you. The solution might be to move to Spain, Portugal or, indeed, Mexico where the climate would be ideally suited to this style of garden. As for medal prospects, it’s rare for an exotic garden like this to win gold, but it’s all in the detail and the judges may yet be swayed by the craftsmanship and plantsmanship. My money’s on silver gilt. Regardless, this is a cracking debut from a garden designer who has the style and confidence to bring a taste of Mexico to our murky metropolis. Tomorrow I will be at the show, taking my own photographs. Those included in this post were taken by the very talented Jonathan Buckley. If you look out for me, I’ll be the one in the sunflower print shirt with a lady in black. Do stop me and say hello. TFG. What a delightful combo we will make just like the plants in this ‘interesting’ garden!!!! I might disappear into the background in my shirt! Now, that does sound exciting! It was almost too hot here for gardening today. Can’t believe it. TOO HOT FOR GARDENING!! 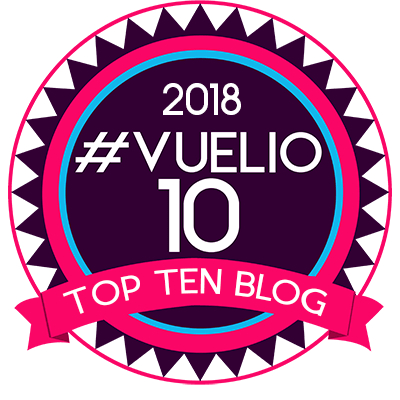 N E V E R that’s why hats and SPF 50 were invented for…. I melt if I go out when it’s over 25ºC. Remember Hampton Court? thanks Paul….it will be so much fun. I’m off there tomorrow….can’t wait. Summer dresses, flip-flops and sun screen I reckon! Sun screen. Good plan. Not on my list. Thanks for the prod. I hope to take lots of my own photos today. Happy you enjoyed this particular post Rodja. 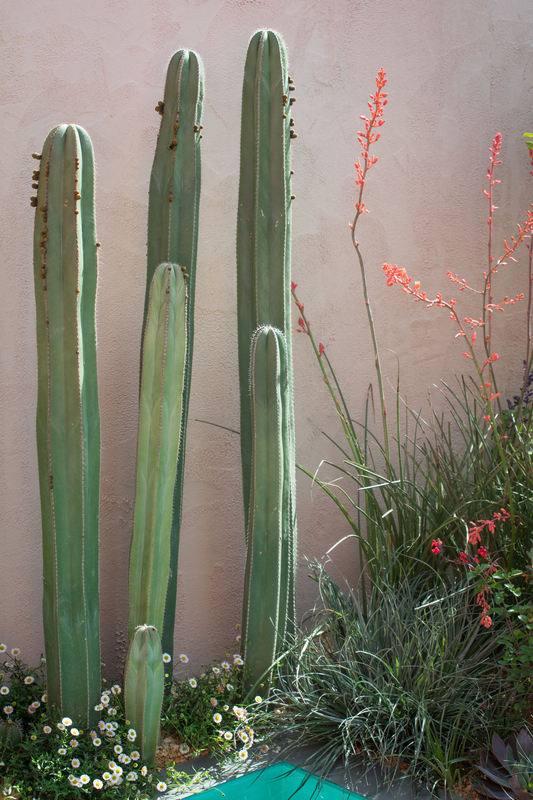 I love desert plants so much, and these look incredible against the backdrop of the brightly colored walls. There is definitely something about this combination. 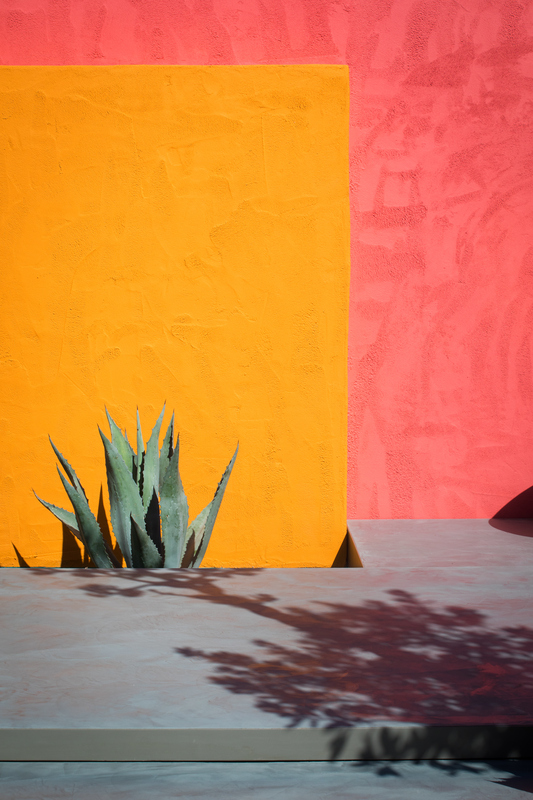 Cacti and succulents are prone to looking a little drab, especially when they are not flowering, so coloured walls really help to lift them and highlight their extraordinary forms. So so gorgeous- a fabulous garden even on the telly, and you have really done it justice. It looked like a real ground-breaker to me- and the only reason to regret not being there this year…ta!! This is such a sumptuous garden, the colours, the shapes it all makes me smile on this sad day. Almost worth queueing up to see it. Thank you for the wonderful photos and for the planting list, brilliant. I recon you and Helen of Oz will be discussing the show over a few more Pimms or gins or whatever else right now… Cheers! I hope you had a really great day and weren’t disappointed by the show gardens either. As I can’t go myself this year I’m really looking forward to your pictures and posts. Thanks for the ones you already published! Love the Mexican garden. Shouldn’t it be possible though (for those with a serious yearning but no chance to relocate) to substitute the cacti and agave with other plants more suited to our climate? The main point is their sculptural form after all – so I’m thinking yuccas, artichokes… And perhaps choose slightly less vibrant shades for the walls, just a little more muted. What’s your opinion: okay or tasteless disaster? On reflection, I guess it might turn into something altogether different. Have a lovely week with Helen of Oz (and hello to her, too!). Inventive and beautifully executed tribute to Barragán. Makes me wish I had gone to Chelsea to see it. It was certainly good to see it in the flesh. The garden was rather tucked away but that meant it wasn’t too mobbed and one could stop to take it all in. I am just about to paint an external wall off white. I had better do it quickly before I change my mind and go for something brighter!